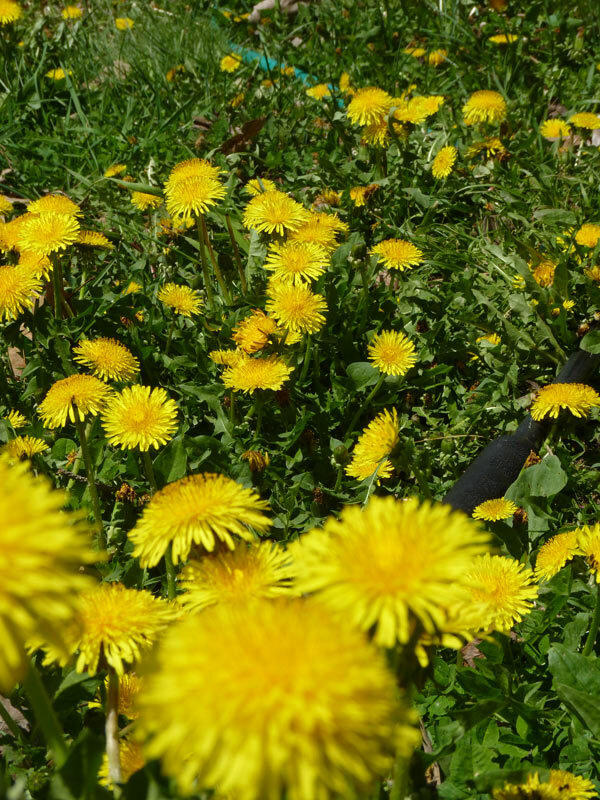 I’ve decided to learn how to make wine from the dandelions in my yard! Why? When John Michael Greer was here a month ago, he suggested various kinds of reskilling to help us transition to post industrialism. One of his suggestions was to learn how to brew something because everyone always wants a good brew–and so, I am. I figured that now is as good of a time as any to learn to make some wine! Lucky for me, one of my good friends brews beer often, so he helped walk me through the process. 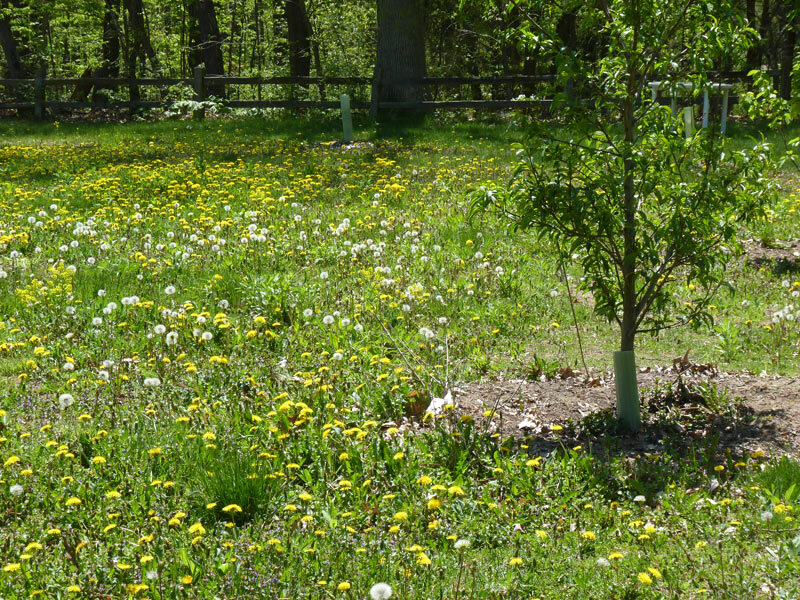 Additionally, dandelions get a bad rap in our society–Americans and other industrialized nations spend millions of dollars and dump millions of petrochemical weed killers on getting rid of dandelions. But as the book Gaia’s Garden: A Home-Scale Guide to Permaculture describes, the dandelion is an incredibly important plant. Its deep tap root breaks up compacted soil, it is full of nutrients, and it works to heal the lawn. To me, if we are going to shift to more sustainable practices and a more spiritual way of interacting with the land, we need to start seeing dandelions as allies, not enemies. And allies they are, providing us with nutrition, medicine, beauty, whimsy, and yes…wine. 1. Find a brewing mentor. 2. Find a good recipe. You’ll also need a good recipe. 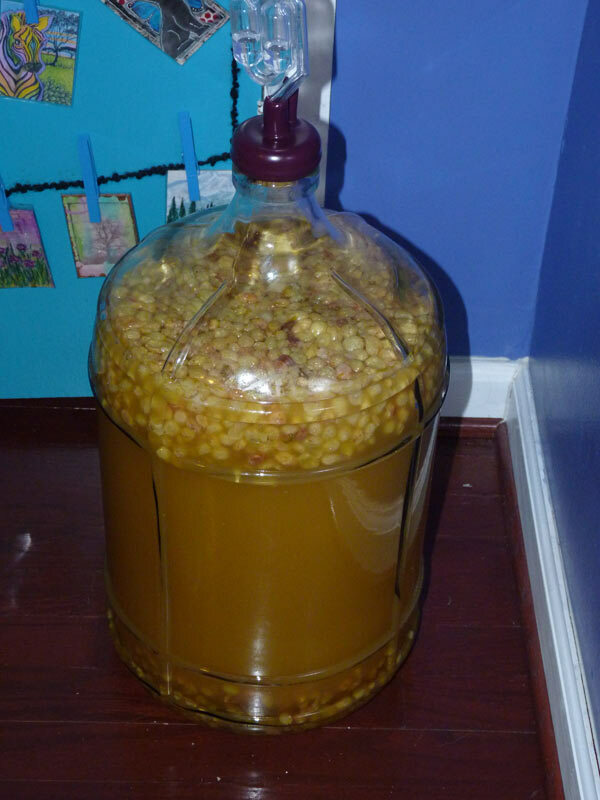 I’m using Dandelion recipe #1 from a winemaking site. I decided I was going to brew a 5 gallon batch so that my friend could have some. 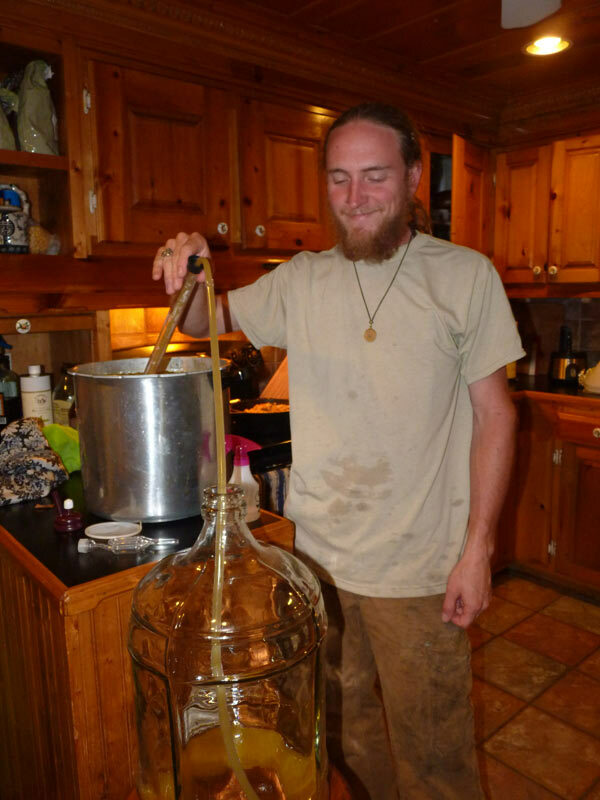 Brewing a larger batch involved some simple mathematics to take the recipe from 1 to 5 gallons. My friend also read online about the recipes and found forums where people discussed their experiences–this is also a good thing to do prior to starting. 3. Get your brewing supplies. You want to get some supplies for brewing–its good to go to a local home brewing business and you can ask questions, get a kit, etc. I purchased a 5 gallon glass “carboy” (which is just a big jug), a siphon to help remove (“rack”) liquid, some equipment for straining, a big funnel, some sanitizing agents, yeast, and yeast nutrient (and cheesecloth, which I forgot). I purchased these supplies from a place in Ann Arbor, MI, called “Adventures in Home Brewing.” I paid about $50 for everything including two glass “carboys” of 5 gallons each. Most of this stuff is entirely reusable–the whole process is cheaper than I thought it would be. The staff were knowledgeable and very friendly. If you don’t have a local supply store, they have reasonable rates for online purchases. 4. Get your recipe supplies. I also had to purchase the food materials for my recipe, which included 10 lemons, 5 oranges, 15 lbs of sugar and 5 lbs of golden raisins. We spent a lovely, sunny hour and a half or so picking 60 cups of dandelions in my organic garden and yard. You want to pick from an area that is not sprayed with chemicals. Pick them when they are in full bloom (in Michigan, this is in early May). We were able to pick enough dandelions for our brew in one day; people with smaller yards or less dandelion bounty may need to pick for a few days. This is better with friends and chickens to keep you company! I’m now going to go through the basic process for this recipe using step by step photos. I have to wait over a year to know if this is ultimately successful, but I’ll occasionally update the blog (this post) to let you know how things stand! This is what 60 cups of dandelions looks like! I boiled a little under 5 gallons of water and poured it over the dandelions. Then it sat covered in my kitchen for two days before the process continued on. 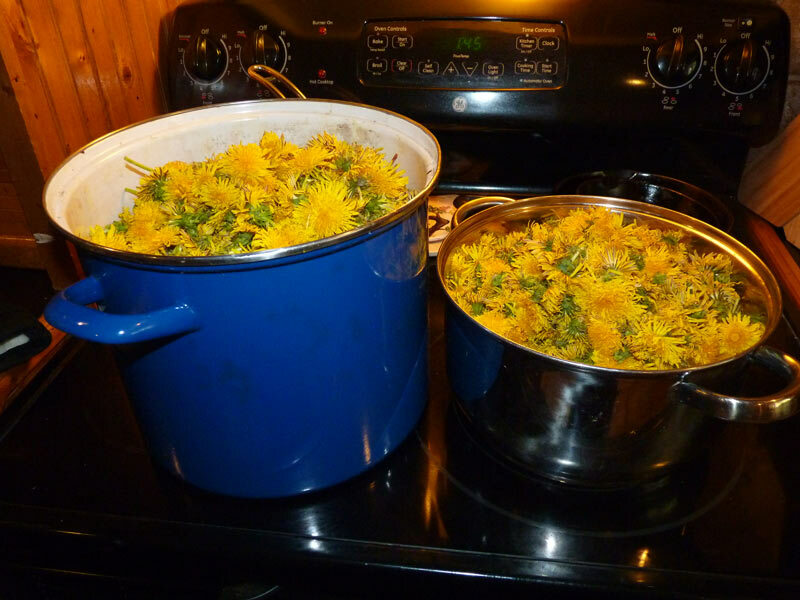 The dandelions in a huge pressure cooker, ready to cook. 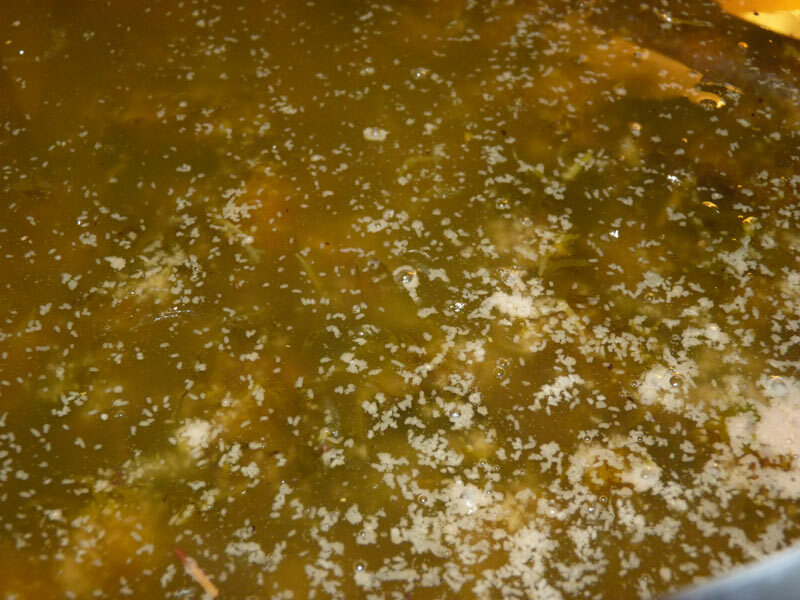 After the 2 days, we boiled the dandelions with sugar and the lemon/orange rinds (no white pith). We added in the juice at the end of the boiling process. After boiling, we waited till it cooled to about 75 degrees (which took about 4 hours) and then added the yeast (this is special wine-making yeast). The whole mixture sat for three days covered, fermenting. It remained surprisingly warm, and bubbled and made little popping noises when you got up close. 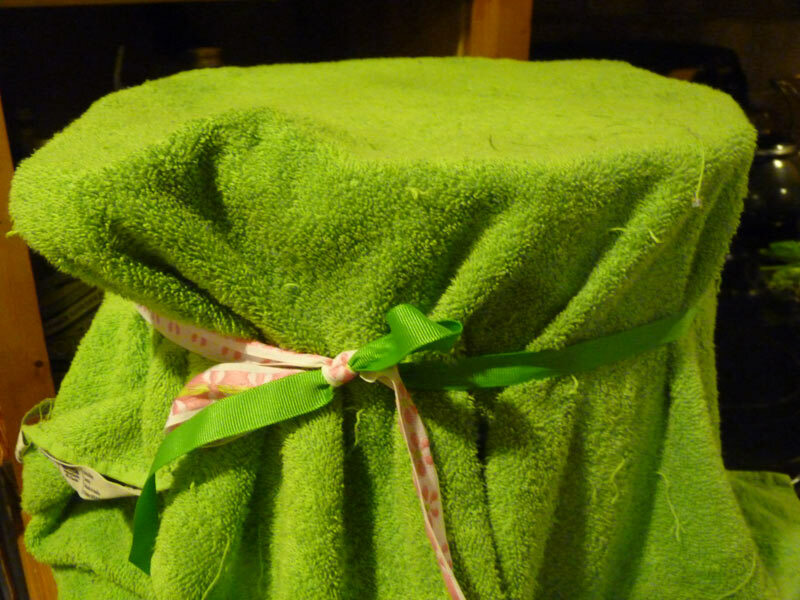 Here’s a picture of the canner with the cloth cover. Sitting for 3 days in an open brew! After three days, we uncovered it. 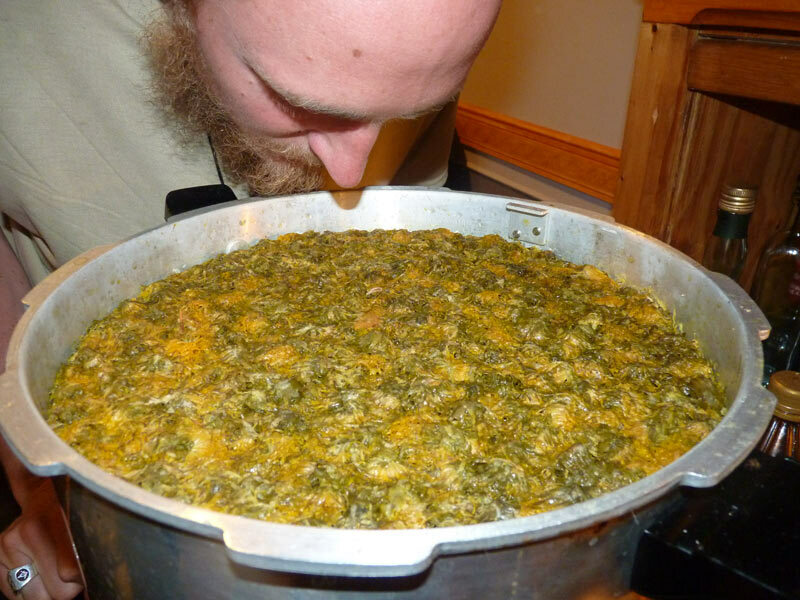 The photo below is of my friend, Paul, taking a big whiff of the brew. It already tastes and smells like wonderful awesomeness. To extract the liquid and begin the first “racking” process, we began by using this cool siphon thing that Paul told me to buy to pull the liquid out of the bottom of the pressure canner and into our “carboy” (that’s the 5 gallon glass jug). This process was really easy and fast–so I would definitely suggest the $12 investment in this little tool. The liquid was a lovely yellow color and smelled awesome! Siphoning the liquid into the carboy under Paul’s careful supervision. I did forget to buy a cheesecloth, but we sanitized a clean cotton pillowcase and used that to strain out the remaining liquid from the dandelions. We added the raisins using the funnel. Once everything was done, we put this neat little cap on it that allows the jug to breathe without adding in any spores from the atmosphere. Now I just wait till the wine “clears” before racking it a second time. Neato thing I forgot the name of. We put it in a warm spot upstairs. This is how it looked this morning, about 12 hours after the process was complete. Its bubbling and going crazy, and you can literally see the yeast eating away at the rasins. The next step is to wait till the wine “clears” then strain it again, transferring it into another clean, sanitized vessel. Then we wait more time before bottling it. After bottling, I have to wait at least six months, but preferably, a full year, before drinking it. So far, this process has been fun and exciting. I’m certainly glad to have friends who have done this before, however, because wine making can be quite intimidating when you are first starting out! But I’m very excited to put these dandelions to use and make my first brew :). Very cool! 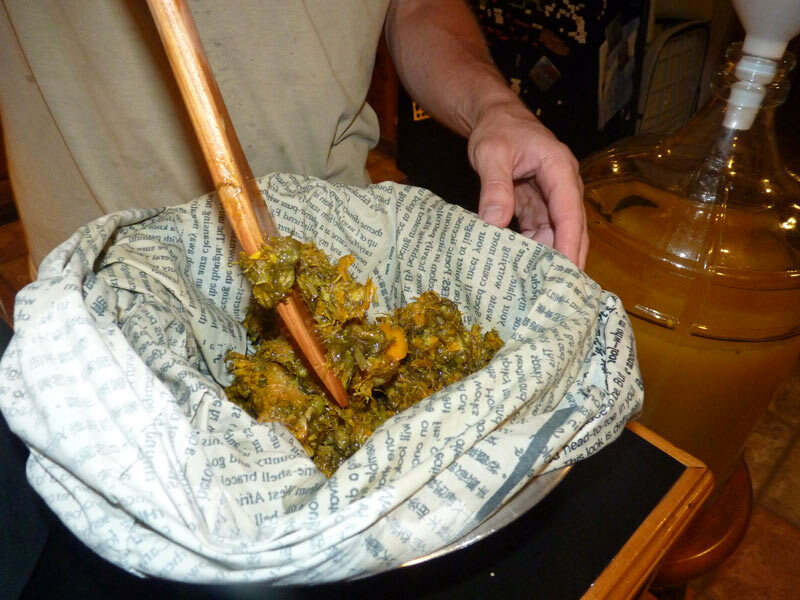 Years ago my first husband made a batch of dandelion wine. He had some experience with winemaking. We tried it after a couple months and it was just awful. So we put it aside and forgot about it for a year–and then it was wonderful. It had a lovely sweet flavor. Yeah, the recipe suggests that a year aging will make it quite good, so I hope to last the year before trying it :). The ink I tried to make with them smelled good…..a bit spicy, like…cardemom/nutmeg. Gluhwein-like. I don’t think a few cups short will make a big difference :). It should still work very well for you! Good luck! I’ve just started to make hedgerow wine. Dandilion Wine is what I aim to attempt to make next and the photos really help. I’ve heard so many different versions of dandelion wine. Some say the green outer petals can be left on !!! I notice that you have left the pettles on but also part of the stem. I assume this is ok.
WOW stems as well.. That makes me feel a whole lot better. I guess that as all of the plant can be eaten then possibly all the plant could go in! How long do you leave the fermentation and how long in the bottle before it can be drunk. You don’t want a lot of stem, obviously, but a little bit is no problem. The more of the stem and leaf you add, the more bitterness you add (while bitterness is medicinal, not everyone wants it in their wine). But if you are popping the heads off of dandelions, it is very easy to get a little stem there, and it is no big deal. 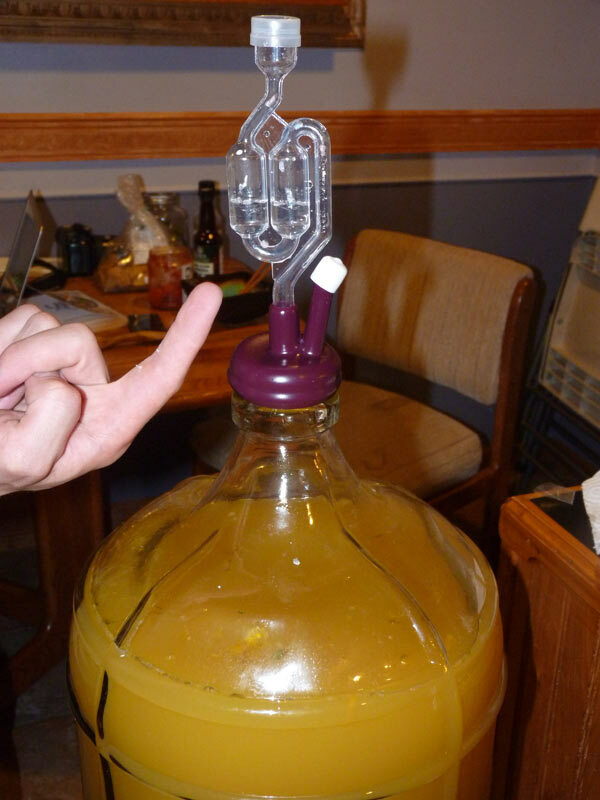 You leave the fermentation go (secondary) until it is no longer active. One year, I forgot about it and it was in there for 5 months before we bottled it (no big deal!). You really want to give it time after bottling–a year will ***greatly*** improve the quality and taste. But you can drink it sooner than that :). It really is a long-term process! Step by step… From the beginning! Hi, you mention yeast nutrient in the first recipe but you don’t state what that is or how much. Also, in your first recipe, you specify 15 quarts dandelion. Is that just petal or can it be the head? 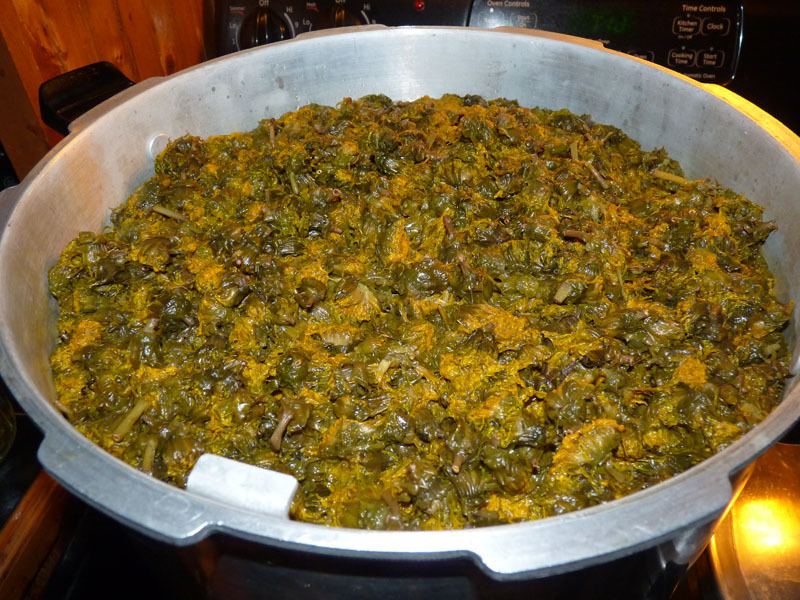 ( I have read repeatedly that the green head leaves and such will cause bitterness and make it difficult for any fermentation to happen. ) Thanks so much for your reply. I have fermented very successfully with the heads on but not the stems, there is very little to no bitterness. For this recipe I used a pack of yeast nutrient, the small packs that you can buy at any brewing store. Best of luck!